My colleague, Martin Rowe, a senior technical editor working on sister UBM publications EDN and EE Times, shared photos of a comprehensive kitchen lighting re-do using all LEDs. 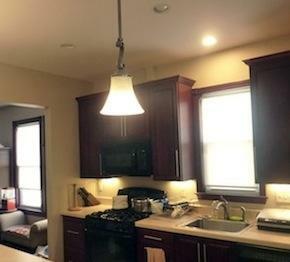 I counted 15 LED fixtures in Rowe's kitchen: 27 LED sources total, on five switched circuits. The three under-cabinet LED fixtures (Figure 1), Rowe told me, were in put in when the kitchen was redone two years ago, before he knew anything about LEDs. (He has since become well acquainted with CCT, CRI, and other arcana of LED lighting.) He believes the contractor sourced them from Lowe's or the like, so they are most likely no-name products of Chinese manufacture. The rest of the LEDs went in about a month ago. They were all from Costco and the brand is Feit Electric. The six ceiling downlights in cans, plus a separate one over the sink, are 65W-equivalent BR30 floods (see Figure 2). They cost about $9 each at Costco after a rebate from the power company, as they are Energy Star rated. 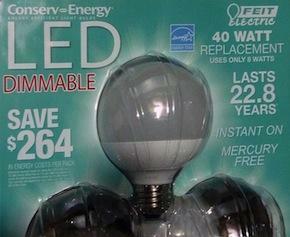 The LEDs in the four-part decorative fixture and the one in the pendant are 40W-equivalent A19 replacement bulbs, the packaging for which is shown in Figure 3. In these photos the lights look distinctly yellow. They are in fact all 2700K CCT LEDs, but Rowe said that the camera he used may have contributed an additional color cast. A more conventional choice for kitchen lighting would have been closer to daylight, perhaps 4000K or above. Rowe used 2700K because the rest of his family "wanted what they had before," which was incandescents. 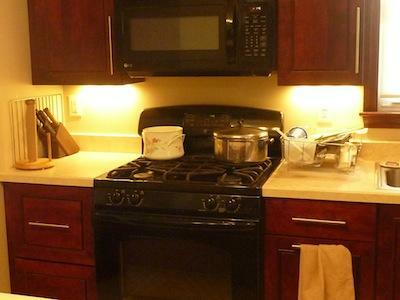 He replaced all of the kitchen lights without telling others ahead of time, and no one complained (read: no one noticed), so he counts it a successful DIY project. Rowe told me that in the past, when he has tried to replace incandescents or CFLs with LEDs, "Any time I got above 3000K, somebody has complained." He said the color consistency across the kitchen fixtures is good. He mentioned that the LED floods are more pleasing in one way than the bulbs they replaced: The light is more evenly diffused and presents less glare than the incandescent's single hot spot. 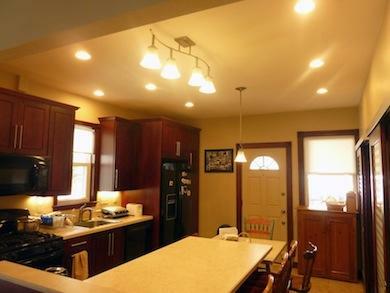 Rowe has a number of other 65W-equivalent downlight floods throughout the house: over a stair, in the living room, and three in his office/study. There are no dimmers in the house, though all the LEDs are rated as dimmable. My thanks to Martin Rowe for sharing his experience with LED lighting. It gives us insight into how a reasonably knowledgeable person with an engineering mindset approaches the changeover to LEDs. As for the rest of the consumer population -- we still have a lot of educating to do.